Malone's Matthew McClean topped the qualifying stage at the North of Ireland Amateur Championship at Royal Portrush yesterday. The 25-year-old optometrist followed up an opening round 67 (four-under par) at the Valley with a bogey-free 68 (four-under par) on the Dunluce Course to finish on eight-under par. The former Irish Boys International, a regular competitor at the North of Ireland, has taken some time away from work to play competitively, and it appears to have paid off. "I have been hitting a lot of greens and working hard on my putting with Malone pro Michael McGee so things are pretty good just now," said McClean. "Hopefully I'll keep playing well and be around here for another few days." The 2017 Irish Amateur Champion, Peter O'Keeffe (Douglas) successfully negotiated qualifying to make today's opening round of the matchplay, as did 2016 finalist Tiarnan McLarnon (Massereene). 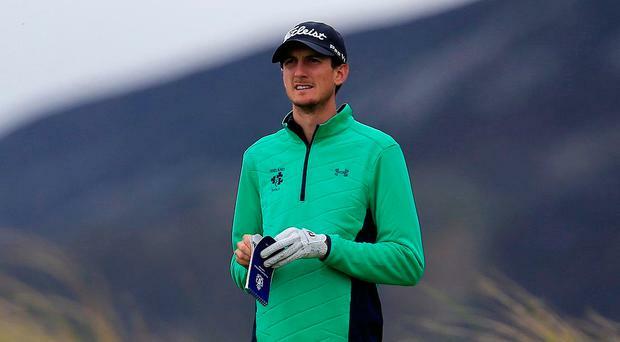 Richard McCrudden (Royal Portrush) finished second on seven-under par, adding a second round 67 (-4) on The Valley to an opening round 69 (-3) on the Dunluce. A birdie three from 45 feet on the second green got him going and he added another from 12 feet at seven, before hitting the long eighth in two and two putting for birdie to record an outward run of 33. Following two bogeys, the local lad got back on track with birdies at the 14th and 17th, steering a sand wedge to three feet at 14 and rolling in a long ranger from 30 feet for a two at the penultimate hole. The cut for the final 64 fell at 146 (+3), with 13 players missing out on that mark including the 2016 champion, Sean Flanagan (Co Sligo). Niall Hearns from Mountrath equalled the course record of 64 on the Valley on Monday, but the Dunluce took its toll on the Co Laois player as his Championship hopes exploded when he pencilled in an ugly 86 to miss the cut. At Castle Dargan, Ulster's women made a promising start to the interprovincial series, beating Munster 5.5-2.5. Ulster's Girls team also claimed a victory, beating the same opponents 5-3.